PS-REPADMIN 1.9 is available now. 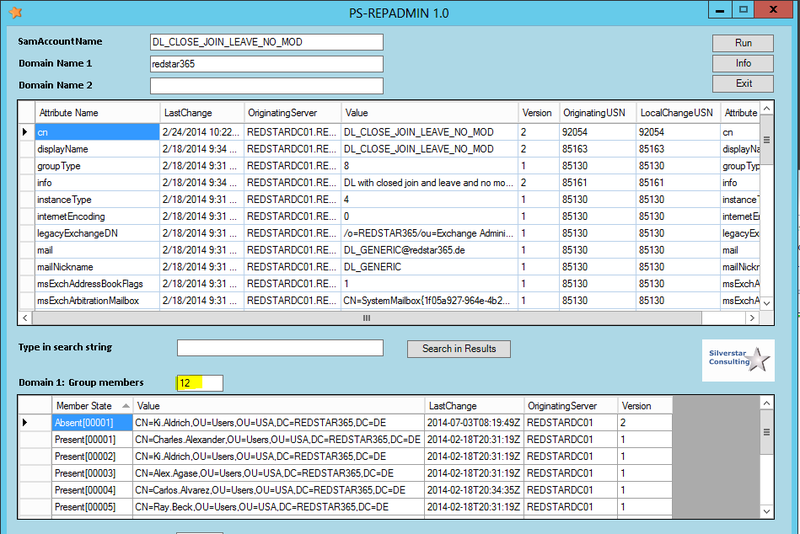 PS-REPADMIN helps to view object metadata and attribute values in a simple table view. We made several improvements in 1.9, especially for comparing groups with their metadata between trusted Active Directory domains. The tool also provides now an easier look on Proxy Addresses and Linked Attribute values. PS-REPADMIN 1.9 was tested with Windows 10, Windows Server 2012 R2 and Windows Server 2016. Usage is on own risk. All rights reserved by Silverstar Consulting GmbH. Download here to test the trial version for free. Full table view on attributes and their last change including group member values. The parallel listing makes it easy to compare values of objects from different domains. Linked attributes are displayed in a separate view for easier comparison. In our Active Directory migration projects and IDM implementations we often come to situations where we need to have a look at the metdata of Active Directory attributes. When different synchronization services can modify attributes and local IT administration is ongoing, it is helpful to see very quickly which attribute was changed when and on which domain controller. Assumption made, that running synchronization services like DSA from Dell Migration Manager for Active Directory and maybe Forefront Identity Manager use different Domain Controllers, the object and attribute metadata can help you to sort out what was the latest change and by which tool in which domain. When we were forced to use the native CL tool REPADMIN over and over to get evidence of what and when changed group membership, we decided to create the GUI based PS-REPADMIN utility. The task of getting the Active Directory metadata at a glance for one identity in one or two domains – including the actual attribute values – is now easier to handle and see. In comparison mode, you can see the metdata of a cross-forest synchronized object side-by-side and find out lack of synchronization streams. The utility is built with Sapien Powershell Studio and fully based on Powershell and .NET. It requires Powershell 3.0 and the Active Directory Module to be present on the executing host. Active Directory Management Gateway Service needs to be present on Windows 2003 and Windows 2008 domain controllers, while no special requirments are necessary for Windows 2008R2 and later. The utility was designed and tested for user and group objects. The executing account needs to have read permissions in all domains on the objects you want to query for the metadata.